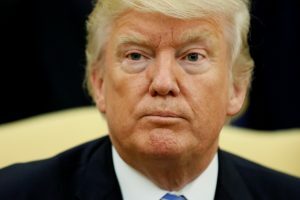 WASHINGTON — President Donald Trump is blasting Democrats and “a few Republicans” over the failure of the Republican effort to write a new health care law. “We will return,” Trump declared in an early morning tweet. A round of new polls show historically low support for President Trump has slipped further since the spring. Amy Walter of The Cook Political Report and Tamara Keith of NPR join Judy Woodruff to discuss the president’s numbers, and how Americans see the Senate Republicans’ fight over the health care bill. At least four of the 52 GOP senators were ready to block the measure — two more than Majority Leader Mitch McConnell had to spare.